2 Responses to Windshield Advertising, Effective Marketing or Nuisance? I am reading this because I have done it for insurance and am considering doing it again. I haven’t done it enough to have any results, but I wonder. 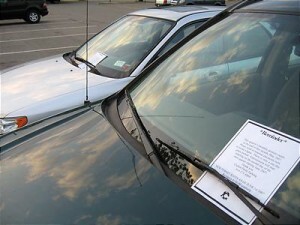 Using a postcard size card, and only do it on vehicles that have a rear windshield wiper and parked in such a way that the recipient would see it when they came to their car makes sense to me. I also have packs of bandaides with name of agency on it and put a tag on that says: Free for Golfers or watchers and put on the trunks of cars so they see them when they put their clubs in. Admittedly, I’ve also done this sort of marketing and received a wide range of feedback. All things considered, I think it’s an effective offline marketing strategy, if used wisely. In regards to your idea, I’m not a big fan of putting anything in windshield wipers whether they are in front or back. People tend to be REAL touchy when it comes to their windshield wipers. For maximum visibility, you simply can’t beat sliding your ad material in the driver’s side door jam, or even the door handle if you can manage it. 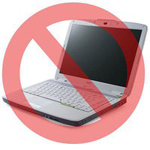 The driver absolutely won’t miss your ad and in most cases will look at it before tossing it aside, or deciding to act on it. Better still, if your content will fit into a smaller area, I would recommend using $100 Dollar Bill Drop Cards and slide them into the driver’s side. 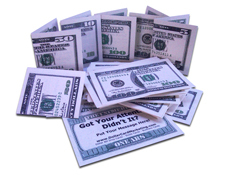 These “drop cards” look like real 100 dollar bills and can be customized with your ad on the back. Money ALWAYS gets attention!